The RM-KB Rackmount Computer Keyboard in Sliding Shelf is part of the Middle Atlantic line of modular rack systems. It occupies 1.75" (1 Space) and includes a high-quality full 101 key, 12" AT style keyboard, with trackpad and padded wrist-rests. It also comes complete with keyboard and trackpad cables including one DB9 serial adapter and USB adapter. An articulating arm provides effective cable management. Finished in a durable black powder coat. Middle Atlantic Rack Drawers are made for heavy use. 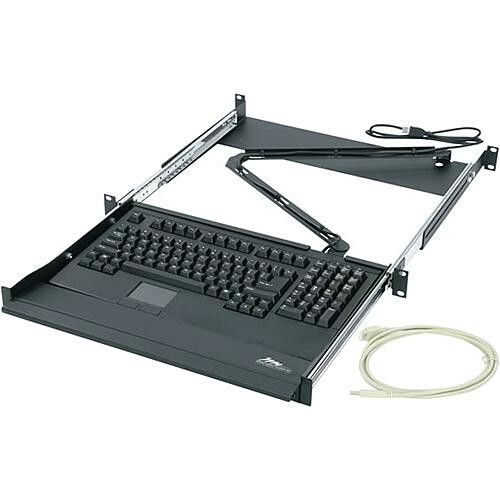 Constructed of steel, this rackmount computer keyboard drawer has full extension ball bearing slides extending 14" to minimize friction and the usual wear and tear. It also carries a three-year warranty. The RM-KB modular sliding shelf for keyboard has everything you need to be immediately functional (except the computer). It includes a high-quality full 101 key, 12" AT style keyboard, with trackpad and padded wrist-rests. It also comes complete with keyboard and trackpad cables including one DB9 serial adapter and USB adapter. This rackmount computer keyboard drawer is designed to fit perfectly with other Middle Atlantic rack modules, allowing you to create the perfect work/storage combination in a rack system. Among the functional assets this draw shares with the five other sizes available is an attractive flush spring latch to keep contents securely closed. Box Dimensions (LxWxH) 26.25 x 25.0 x 4.75"
Is the keyboard compatible with a mac mini?